White suits and a face mask are a necessity! This is more important than bringing camo. We often hunt in pea and lentil fields with very little ground cover. As such layout blinds sometimes stand out too much making it more effective to wear white and try to blend in with the geese rather than to try and look like the ground. Even when we are hunting in the layout blinds, wearing white is often better than camo should you get caught out of your blind with birds approaching. 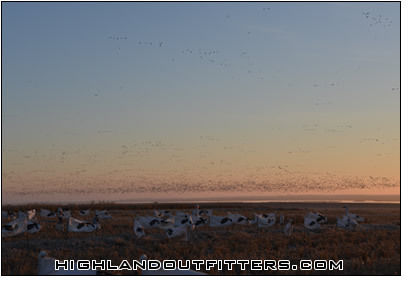 All the birds we hunt are accustomed to feeding with white geese so we may even do this while hunting ducks and dark geese. Any white covering will do from disposable painters suits to old bed sheets to snow camo. A facemask that you can see through and shoot with is extremely important. Please remember to bring this.